Bookings must be made directly with Cote Ghyll, must include 1 child in your party and the offer can not be used in conjunction with any other offer. 10% off for families when booking two nights or more in a room at the Mill between 8th – 23rd April 2019. 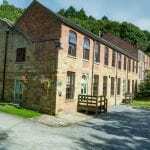 Cote Ghyll Mill is offers affordable family accommodation in family rooms with self catering facilitis and and in house bar and a dining area that can supply meals. Meals are available to guests of the Mill and the Campsite, so why not order fresh bakery items to take away for breakfast or sit in and enjoy a full English to really get your day started.